Neutral colors are used not only on walls but are typically used for fixed furnishings as well. This makes for permanence in your decisions and less flexible changes down the road. 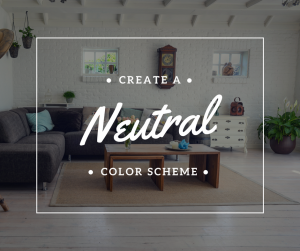 Deciding upon the neutrals that work best for you will set the tone for the rest of your color decisions. So how do you decide what neutrals are right for you? Neutral colors are ideal for fixed elements as they are bigger commitments and should be thought of as more timelessly designed elements in the home. You want them to be able to survive a trend or two! One way in which you can determine what neutrals will work for you is by looking at current trends. Currently, grey, black, and white rule the show, but something that isn’t often thought about is that neutrals are themselves colors. It is important to understand that though neutrals are thought of as the mediator of color, they are in fact themselves made with many different color undertones. For example, neutrals can have pink, yellow, green, blue, or even violet undertones. So when you’re determining what neutrals work for you, look for neutrals that have compatible undertones so that they can adapt to and compliment the brighter colors that you incorporate into your home.